I have reams of notes at this point, compiled over a month, scattered across two legal pads, all of them attacking the same issue from a dozen different sides: what kind of textbook would a veteran teacher use? Veteran teachers lean on textbooks far less than new teachers do, choosing to build their curricula, instead, from a patchwork of problems and applications and sequences they’ve determined through years of trial and error. Like other teachers in the first thread, I use textbooks for longer practice sets, but little else. The question hassles me, then, what kind of textbook or supplement would veteran teachers use? This seems like a potentially interesting, potentially profitable, discussion. New teachers teach procedure better than concept. Procedure is important — you’ll never hear me suggest otherwise — but procedural knowledge is a lot easier to teach than conceptual knowledge, which demands of the teacher both a broad and narrow understanding of (eg.) Algebra, an understanding which can clearly explain (eg.) why the constraints of single-variable equations eventually demand two-variable equations which then demand upgraded solution procedures, etc. I’m very interested in better conceptual teaching and, especially, in teaching conceptual curiosity. The fact is that dead-tree textbooks are at a disadvantage here. 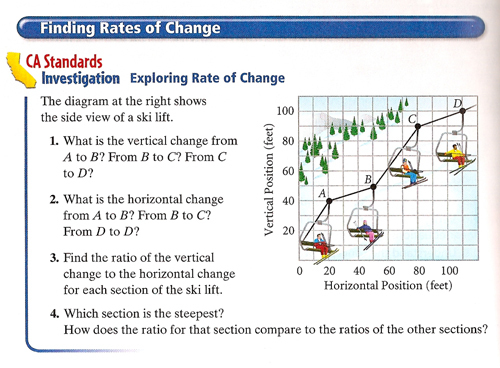 Like I said before, I am generally uninspired by my textbook’s perfunctory stabs at real-world relevance but even when the textbook stumbles over an interesting image (a ski lift, for instance) the nature of paper means they must apply the entire mathematical framework — the labeled points, the grid, the scaled axes, and the questions — before the student has even given the image a first glance. They get the process exactly backward. They teach kids to support a math problem with a visual framework rather than teaching them to support visuals — the sort of images they’ll see long after they close their last math textbook — with a mathematical framework. I can teach procedural fluency pretty well on my own but I need help teaching conceptual curiosity. I want to teach my students to ask questions for themselves and my textbook is no help. I need something else. I can’t put an exact price point on this hypothetical curriculum, but I promise I would pay a lot for a digital archive of very interesting mathematical media, high-resolution images and videos to propel long, rich, curious mathematical discussions and activities. The publisher would supplement the DVD with a small book of concise questions, the sort of visceral hooks we pursue in our What Can You Do With This? series. What would you pay for, let’s say, forty of these high-res digital artifacts and the relevant hooks, artifacts which students could download to their laptops or netbooks and play with, scaling a golden ratio rectangle all over a high-res image of the Parthenon, for example. I would consider it a bargain at $80, but, I admit, this is my post. The profit margin here should entice any publisher. You aren’t printing hundreds of student textbooks. Your printing costs are limited to a small run of color booklets. And some screen-printed DVDs, I guess, but we’re talking about pennies. This wouldn’t be a traditional standards-based textbook, though, so you can’t expect mass adoption. You’ll make your money on margin, not on volume. Seriously: a good DSLR camera, a good HD camcorder, and a handful of travel vouchers. That’s your overhead. The shameful side to this proposal is that publishers have already budgeted money for this kind of supplement — the same bundled CD-ROMs which have driven textbook prices skyward. Having just finished a textbook adoption process, sampling bundled materials from several publishers, I can report that in the rare case that these materials aren’t useless, they’re entirely cumbersome, locked down by web-access codes, DRM, proprietary Flash interfaces and constrained to printable textbook pages and videos of talking heads explaining rote procedural skills. I’m pretty sure this kind of project would suffocate under the weight of any of the big four publishers (though I’d somehow convince myself to cash their checks). It would be great to see a smaller imprint take this on. Takers? There’s no teacher desk. There isn’t now. I got rid of it in August, which I consider one of the small successes of this school year. I sit (when I do sit) at the writing conference table or among the kids, which is astonishing– astonishing– in its simple power to help me communicate with and manage the class. More on that later, I think. Can’t remember the last time I sat in my teacher desk during class, but last week I didn’t have answers for the six assigned classwork problems so I declined student questions for five minutes and sat among them, asking myself questions aloud, in part to model the problem-solving process, and, in full, to disrupt the buffer I have inadvertently established between the teacher and his students. PS: Dina Strasser is my favorite new blogger of 2008. Go subscribe. PPS: I have no problem with Edublogs monetizing their unpaid blogs but those double-underlined ad links had better be generating millions because they’re the most annoying advertising on the ‘net. Until I install the relevant Greasemonkey script, I instinctive reload every Edublog site I visit, just to clear them out. The intent of my evolution post was to describe the challenges I face now, five years in, versus those I faced fresh from college. Others took this for, variously, prescription, condemnation, arrogance, political grandstanding, and, inevitably, a recipe for burnout, all of which missed the mark, though I enjoyed thinking that last one through. The effort I expend doing what I can to raise student achievement gets out of control here at the end of term. Students camp outside my door with clear goals, looking for help, looking to prove they know what they didn’t use to know. I take a ten-minute lunch lately but the returns are so consistently fun that they overwhelmingly counterbalance any risk of burnout. What does burn me out is the realization that I have resolved the largest challenges I faced as a new teacher. I am at a place, for example, where classroom management no longer challenges me. Not that every day is all smiles and hard work, just that I have identified the mix of engaging instruction, mutual respect, and tough love that eluded me for years. Maybe that sounds great to you, and it was for me, for awhile. Can you see, though, how resolving one of the challenges which used to define my professional existence has created a vacuum? How, for a teacher who got into teaching more for the pragmatic challenge than the emotional calling, this has resulted in a kind of post-partum depression? I enjoy the job more now than I did then. The job is easier, certainly, now. But ease and enjoyment rank lower on my list of Good Reasons To Invest Thirty Years Of My Life than a compelling challenge. I’m trying to say that I need more failure. I have experienced too much success this year, not because I’m so amazing, but because I have failed to fill the challenge vacuum with meaningful, overarching goals, goals that I will fail to meet, say, three days out of ten for the next three years, that failure keeping me lean and hungry. I felt frustrated throughout that thread, trying to explain that, yeah, I understand that art is everywhere, etc., but that in our schools, in my practice, art has been carefully parceled into its own forty-five minute block, and I don’t have the luxury to pretend or pundit like it isn’t. To infer a lesson for writing about education from Carl: agitate and fight for your ideals but please feel free to toss a pragmatic bone at those of us who have to do what you only talk about. If you don’t — if, for example, you ignore the fact that I have 25 standards and sub-standards to cover in 180 hours, that my school has 15 mobile laptops to share across the school, that I have to respect issues of scale, that there are separate credentials for teaching art and math, etc. — I’m sure you will find an audience of like-minded idealists, but you risk rendering yourself irrelevant to the only people who can animate your idealism. If I ever leave the classroom, someone please remind me I wrote this.